Archive for the ‘Cycle Truck’ Category. John Speare has my old Cycle Truck now (giving me room in the basement to make a new one). As part of the deal I wanted to make a new rack for that bike. 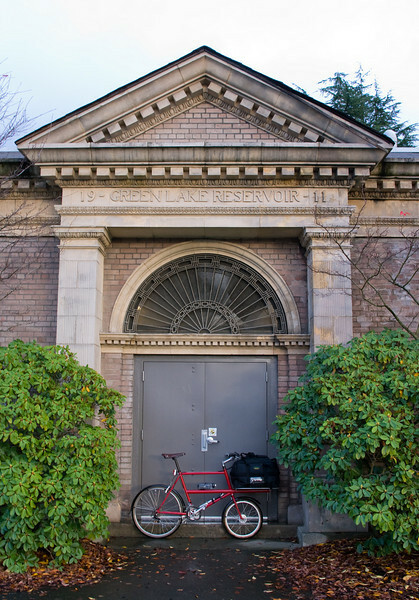 The original rack is long and narrow (20″ long, 16″ wide) and after riding that bike a lot I came to the conclusion that a short and wide rack would be better. 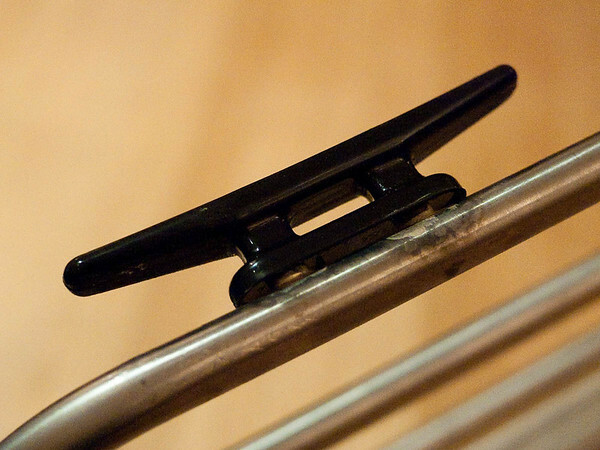 This will encourage keeping the loads closer to the head tube, which is the key to carrying heavy loads and having good handling with that bike. In addition to the size differences the new rack has also gained a U-lock holder behind the backstop and some cleats for holding die down ropes. 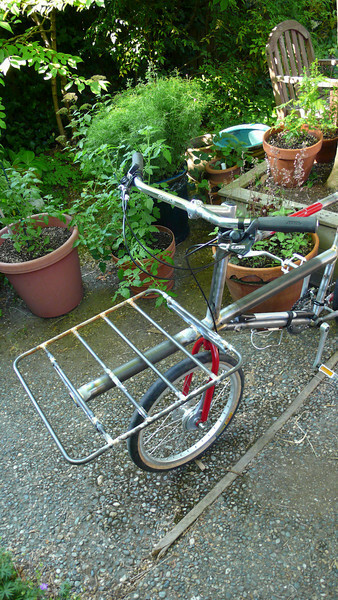 I copied the cleats from Joseph Ahearne’s lovely cycle truck that was shown at the OBCA show a couple of weeks ago. 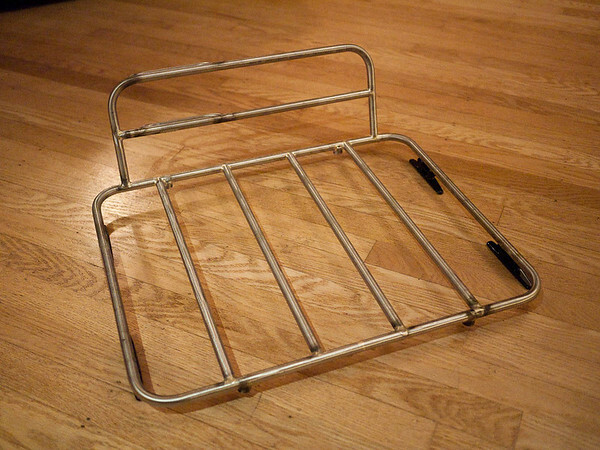 The new rack is made out of stainless steel (316) and was my first rack made with the material. 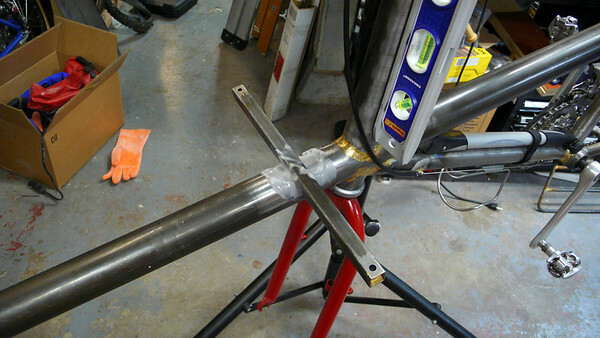 It is challenging to work with, mostly because brazing it is trickier. The bronze filler that I normally use doesn’t work with stainless. I tried three different fillers (Harris 45% silver, Cycle Design’s Fillet Pro, and Nickel Silver from Gasflux). In the end I used the Harris 45% silver on the joints which wouldn’t see high loads and nickel silver on the ones that would. The Fillet Pro was the nicest of the three to work with, but I have limited quantities of it and wanted to save it for my framebuilding projects. Nickel silver is very strong, but melts at a higher temperature and was harder to use. The fillets also don’t clean up as nicely. 45% silver is the weakest of the three, but easy to work with on stainless steel. In the photos shown here the rack is just about finished. 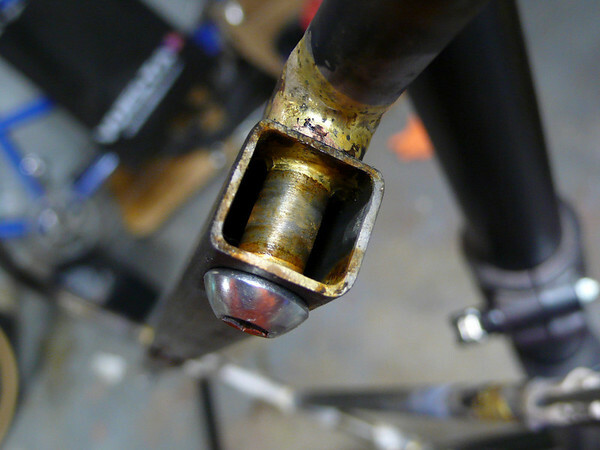 I have some cleanup work to do around the brazed joints (that will remove the smoky color near some of the joints). The underside of the rack. You can see the 4 cleats as well as the 4 mounting points that hold the rack to the bike. A closeup of one of thecleats. The rack has stainless water bottle bosses as mounting points, and the cleats screw into those. I’m delivering the rack to John a few days after Thanksgiving and will take some photos of it installed on the bike then. I did some finish work on the Cycle Truck and sent it off to be powder coated a couple of weeks ago. It was coated by Seattle Powder Coat in Ballard. They did a nice job at a reasonable price and with a very quick turnaround. 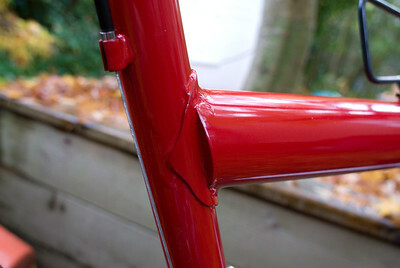 The paint is red to pay homage to the donor frame and fork that were used to build the new one (both were also red). The rack is a silver/grey. I modifed this pizza delivery bag (thanks to James Black for telling me where to get one cheaply) to fit onto the rack. The bag is 20×20x12 inches and fits perfectly. In this photo I’m carrying a roughly 50lb load of bird seed, cat food, and random bits from the hardware store. 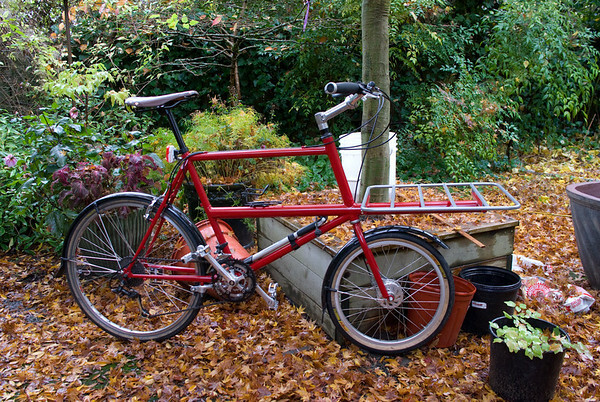 I think this bike works well for bulky loads (better than a porteur) and okay for heavy loads (the closer they are place to the headtube the better). I don’t think it does great for loads which are both large and heavy. 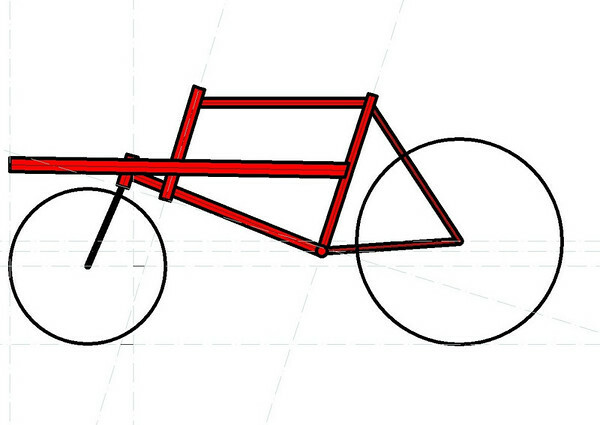 It isn’t good if there is a lot of weight too far forward of the front wheel. If I build another one of these I may put the front wheel about a foot forward. 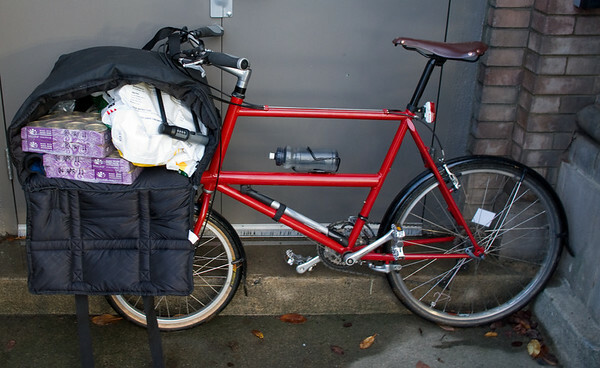 It would complicate the frame and it would no longer fit on standard car/bus racks, but it wouldn’t increase the bike’s overall length and I think it would improve the handling with some loads. 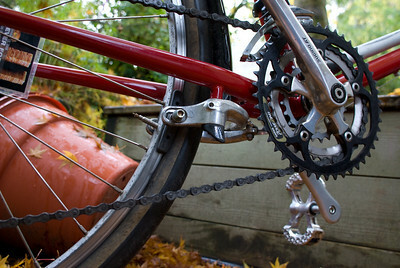 The a downtube shift boss was added which connects to the original U-brake. That makes a very nice parking brake. V-brakes mounted on the seatstays provide the main rear braking. The back of the cargo tube was sealed with a little bit of steel plate. This area ended up being fairly complex. Next time I might try ovalizing the cargo tube where it joins the seattube to avoid this extra work. This weekend I also did my first major project with the new milling machine. I made a V-block for clamping a fork steerer tube. This will be the basis of my fork building jig and my fork alignment system. If you are interested in how I made it then click on the picture to see a gallery with more info. The new mill is working out very nicely. I had a little bonus free time on Friday so I built the rack for the Cycle Truck. It is 18 by 20 inchesand made of 1/2 inchdiameter cromoly tubing with a 0.035″ wall thickness. The rack itself is very basic and didn’t require much tricky work. It is a 2 dimensional rectangle and doesn’t have any stays or back stop (a back stop is not necessary since the head tube acts as one). The connection between the rack and frame was the hardest part of the project. 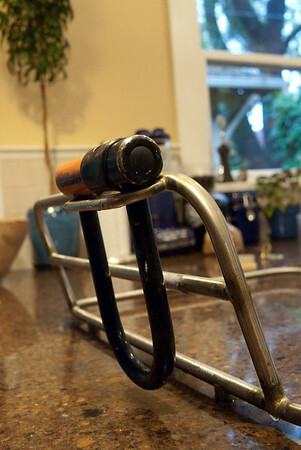 The frame has two support bars brazed to the cargo tube. These are made from 5/8″ square tubing and are mitered to fit around the cargo tube. I was careful to make sure that these were square to the cargo tube and head tube in the horizontal and vertical planes. 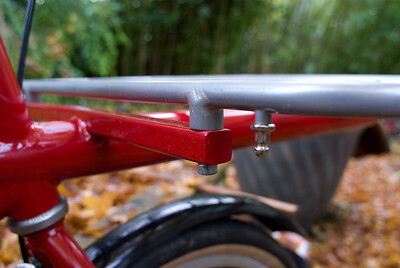 The support bars have 6mm holes at each end that the rack mounting bolts run through. The bolt, support bar, and rack look like this when connected together. 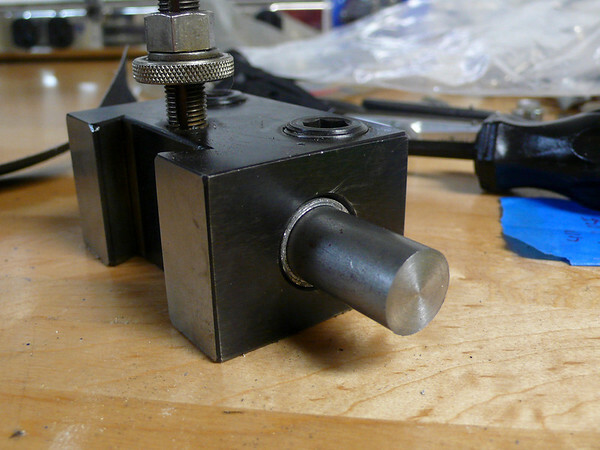 The bolt goes into a threaded pillow block that I made on the lathe. The pillow blocks are brazed onto the rack. 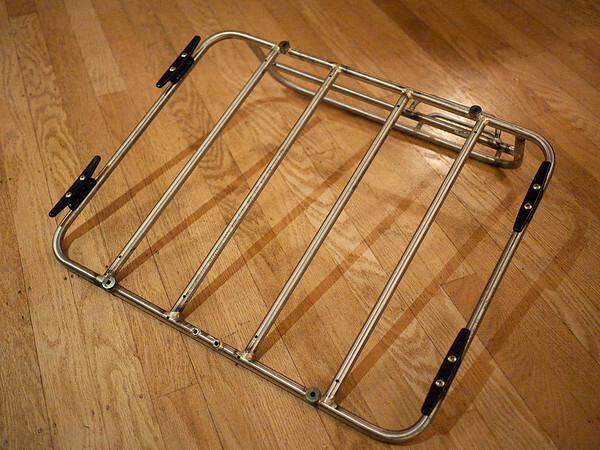 I thought about just brazing the rack directly to the frame, but wanted it to be removable so that I could easily replace it (if it gets damaged) or exchange it for a cargo box if I end up making one of those. The hardest part was getting everything to line up well. 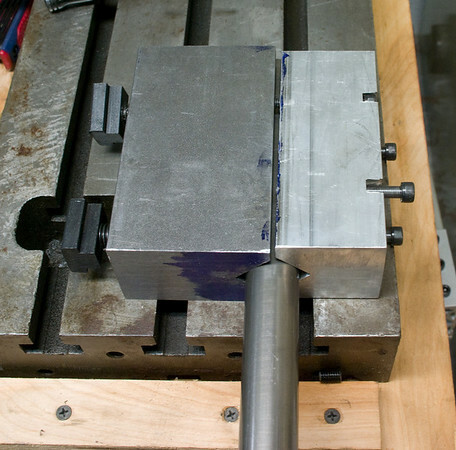 There is no tolerance for error in the fitting of the pillow blocks to the support bars, the distance between bolt holes and the threaded part of the pillow block needs to be exact. What worked best (after some bumps along the way) was to braze the rear support bar to the frame, then thread bolts through the pillow blocks. The rear pillow blocks were tacked to the rack, then I placed the front support bar on the cargo tube and did the same thing there. Since all of the bolts were in place during the brazing everything was perfectly aligned. 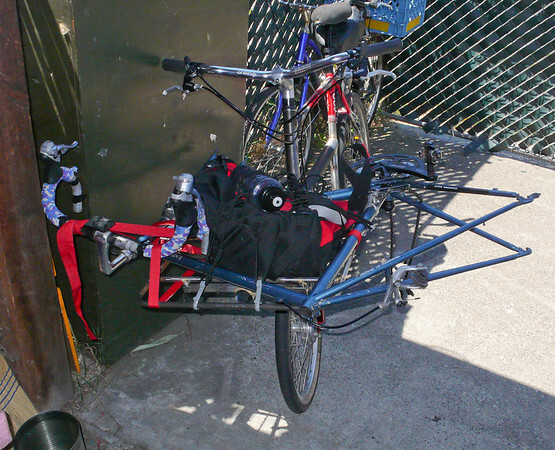 I’ve done some load testing around the neighborhood with a 40lb load and the rack and bike handled well. I’ll be doing more rigourous testing and with higher loads later to see if I’ll need structure tying the rack to the frame. I expect that I’ll be adding two more stays that go from the rear support bar to the top of the head tube. This will both add some rigidity and will give me a nice place to mount water bottles. My goal is for the bike to ride nicely with loads in the 50-75lb range. On Sunday I used it to carry this bulky but fairly light load. 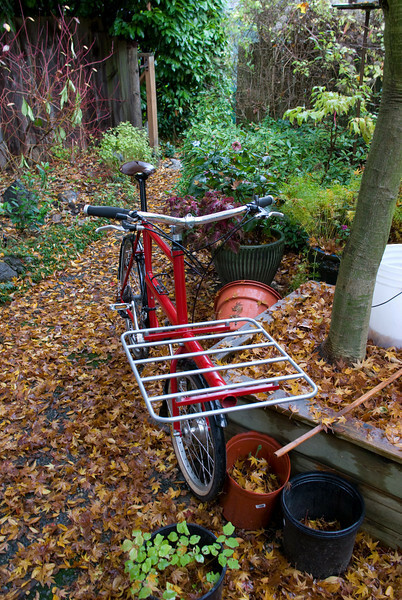 This is the kind of stuff that is really a bit too big for a normal porteur rack but small enough that I don’t like having to pull my trailer out for it. The Cycle Truck fits that niche between trailer and porteur nicely and I think I’ll be using it quite a bit. I’m reorganizing the Cycle Truck photos into a new galleryto try and make it easier to understand the whole process without having a lot of extra photos. My only regret in this project is that I often got too involved and forgot to pick up the camera and take a helpful photo or two.